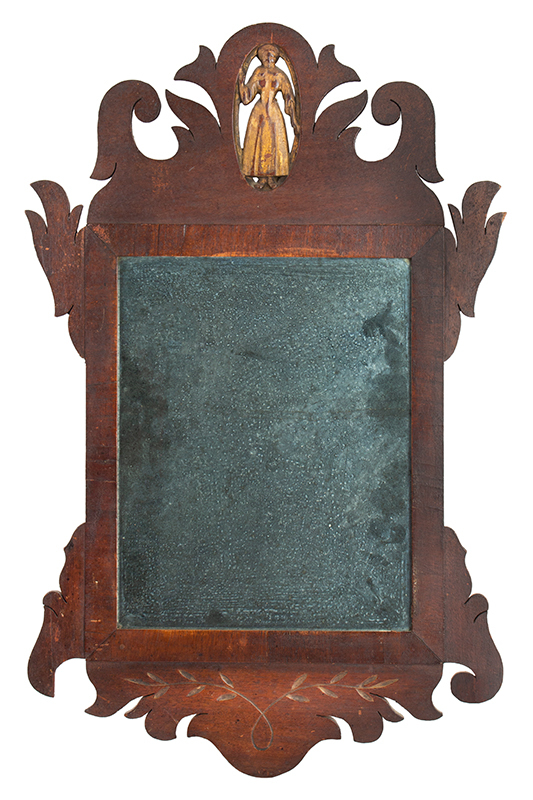 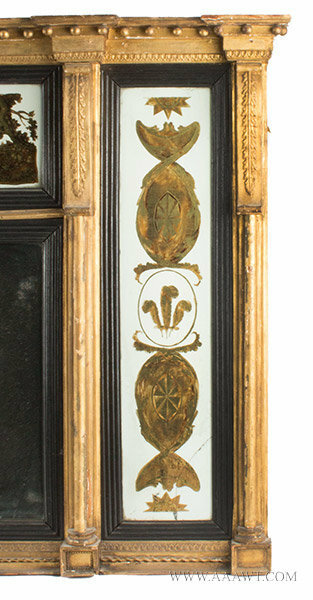 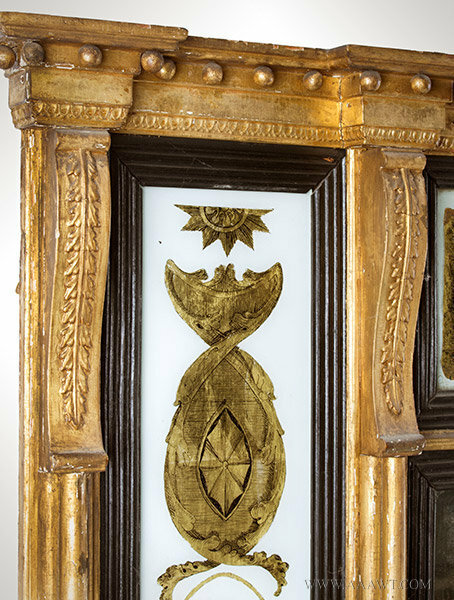 A 18th century Philadelphia looking glass bearing original label, arching scrollwork crest featuring pinecone ears, and similarly scrolled bottom centering molded slip. 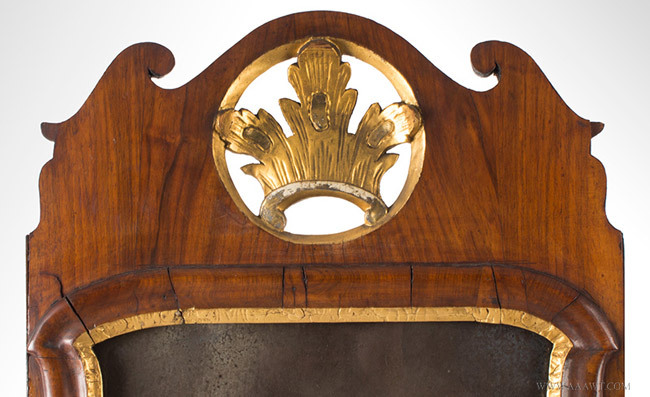 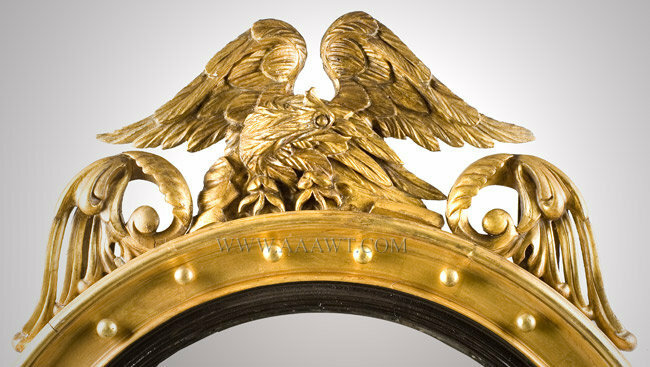 (The center lobe of crest has a horizontal fissure and has been repaired; it is missing a very small and easily replaced piece of veneer; we note that a 2” section of bottom lobe is replaced; 35.5 x 17.75"
Walnut and gilt gesso with a scrolled crest and pierced and gilded Prince of Wales feathers above a rectangular scroll molded slip with central mirror plate flanked by scrolled ears above a shaped apron featuring recessed carving. 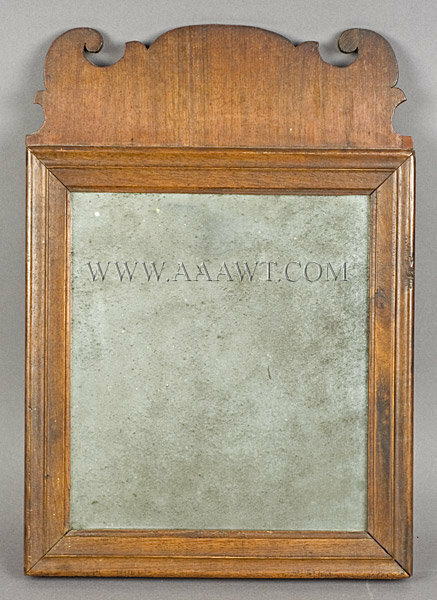 (One scrolled ear replaced, otherwise very attractive, imperfections are minor and commensurate with age. 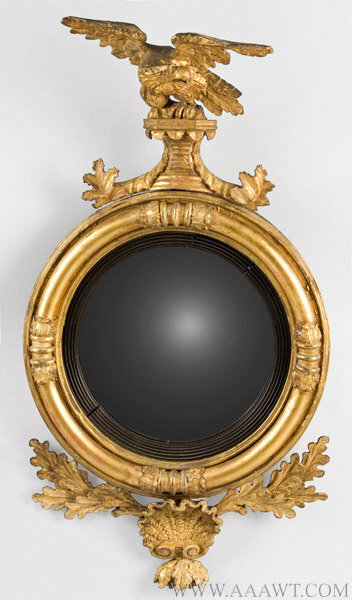 The magnificent, fine and ornate carved and gilt frame with heavily carved scrolling, floral motifs and piercing centers a no less than incredible engraved mirror-plate that is surmounted by an engaged carved canopy set with engraved mirror-plate; the base with similar carving and inset plate receives a pair of scrolled arms with acanthus ornament, knops and turned candle sockets. 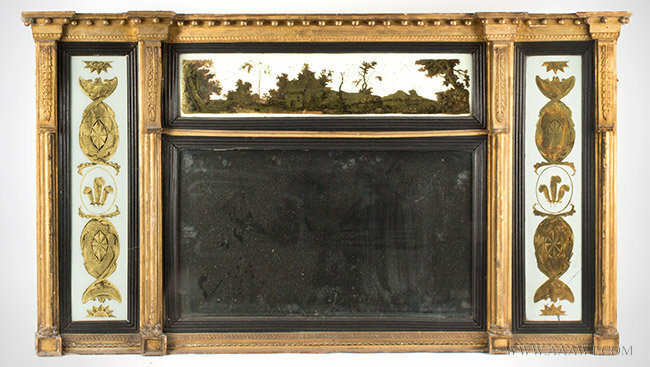 Architectural cornice with orbs above three part frieze featuring Eglomise panels, centered by molded and engaged columns enclosing central mirror plate; each section within ebonized reeded liner. 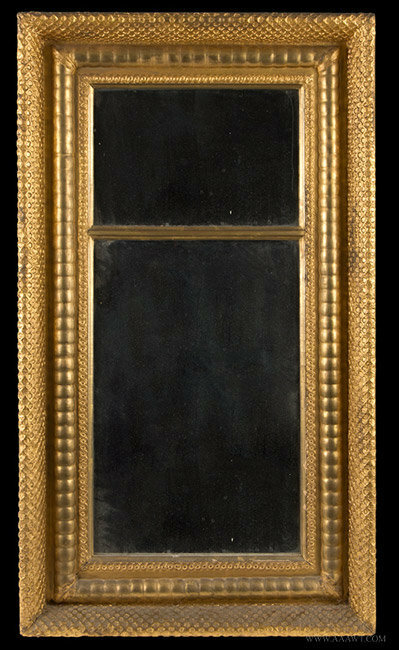 This rare glass awaits restoration, scattered surface imperfections, missing backboards; proper left glass panel is cracked near bottom. 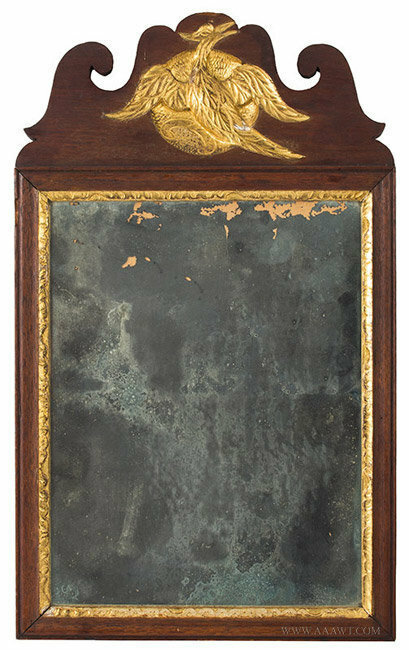 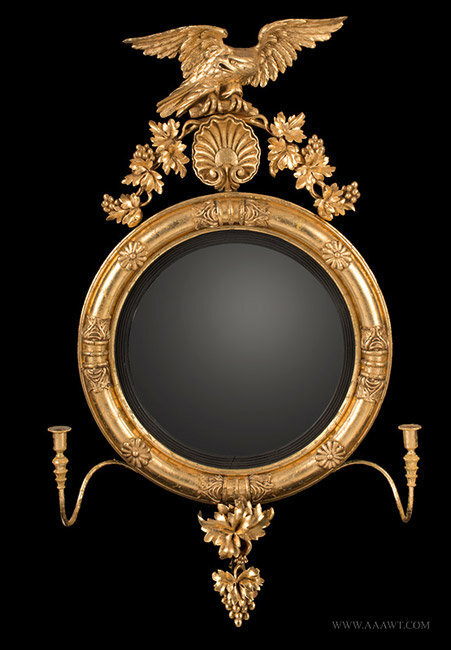 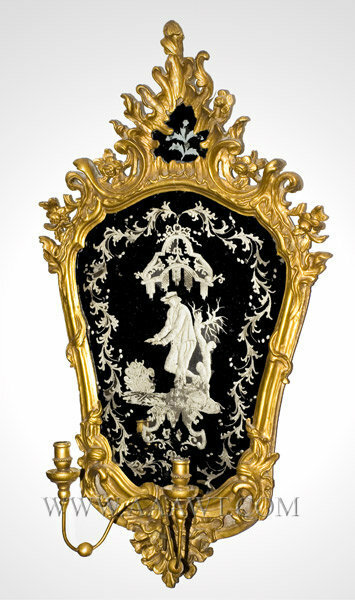 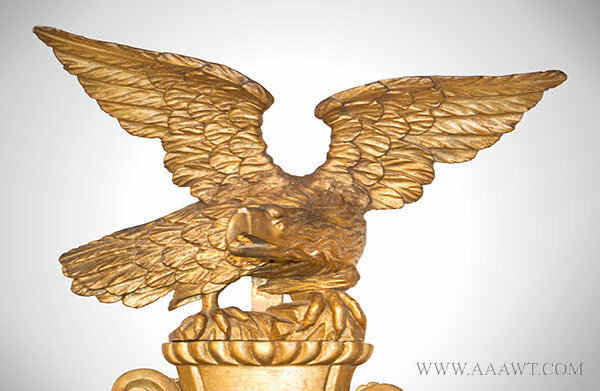 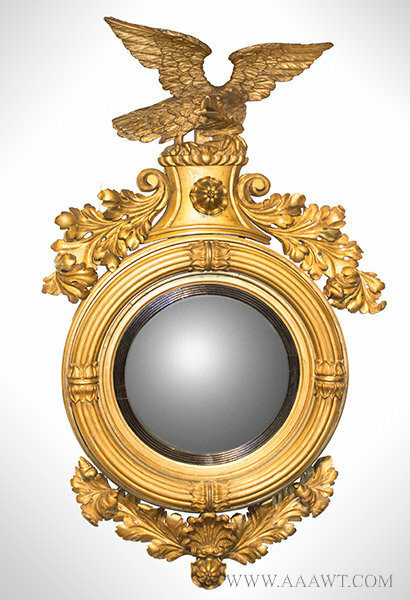 Carved and gilt, eagle on rockery plinth with floral carved boss centered by acanthus carving surmounting molded frame featuring black-painted molded liner; surrounding a convex mirror plate; all above shell, flower and foliate carving. 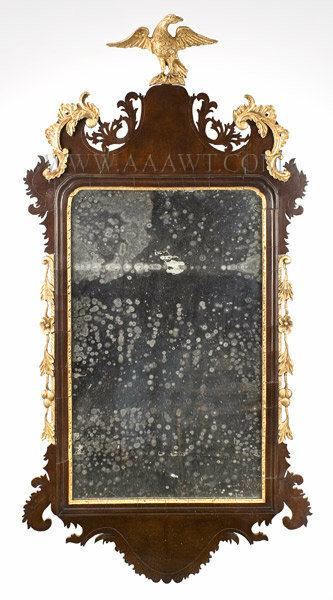 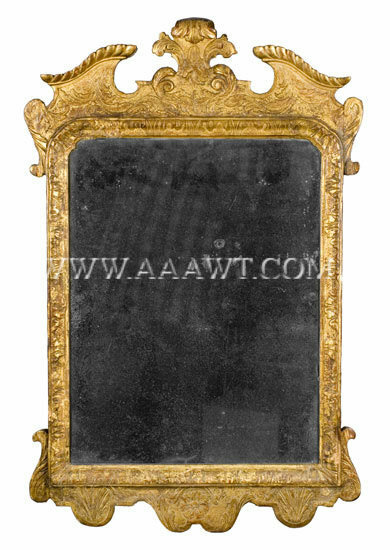 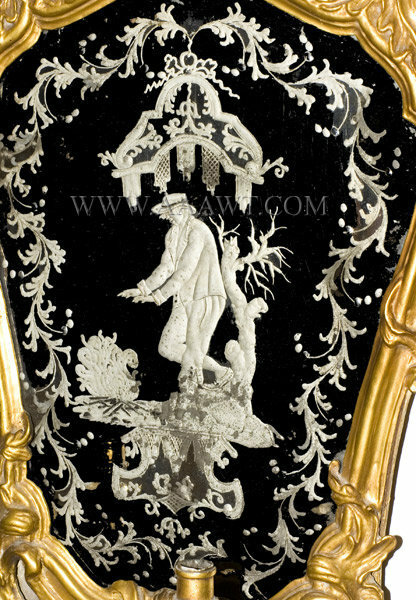 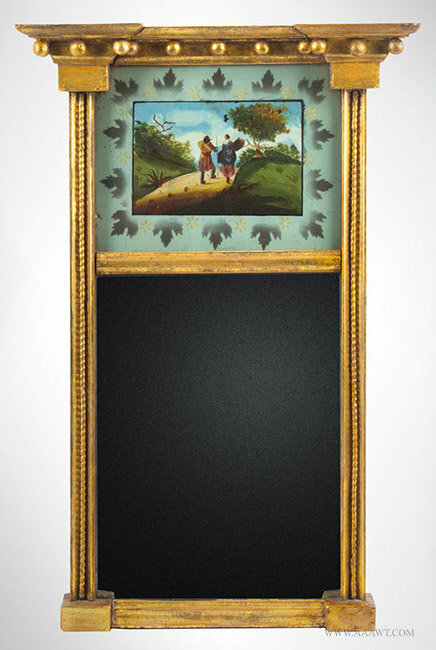 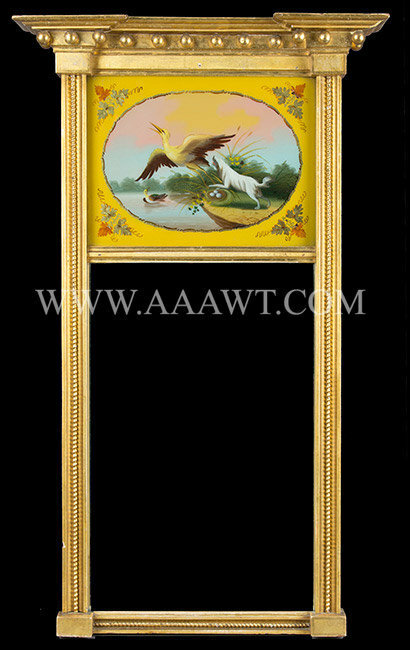 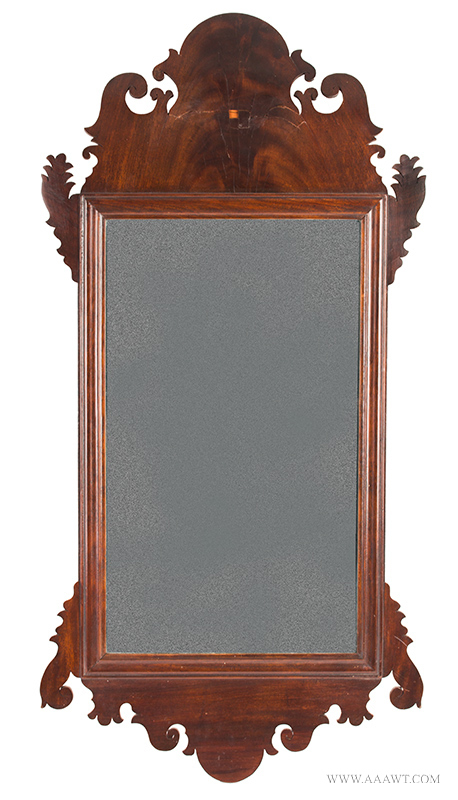 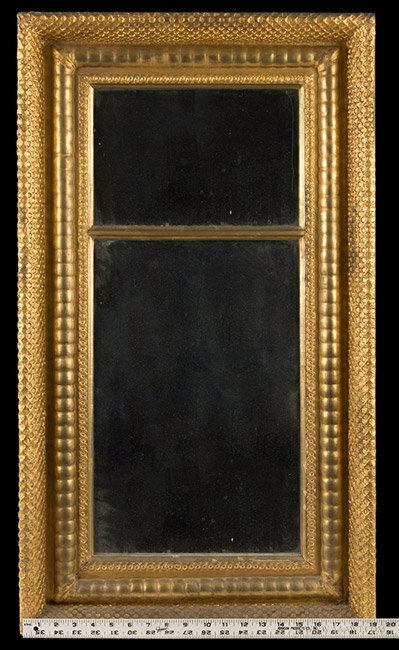 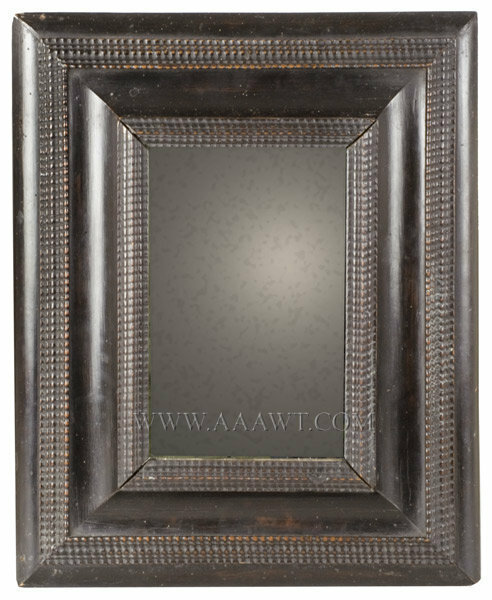 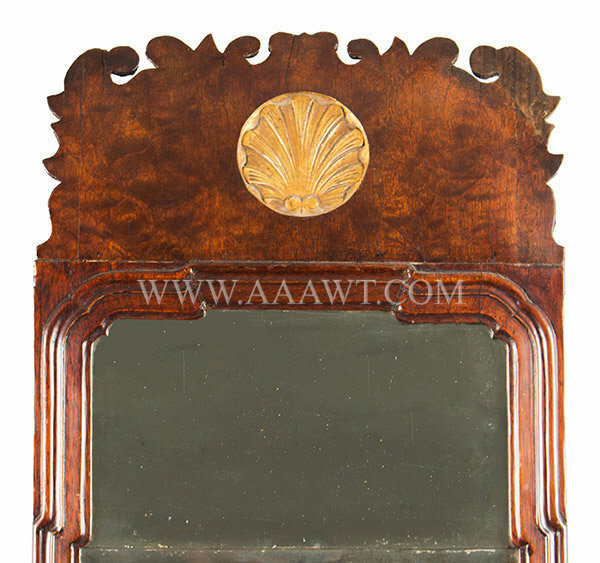 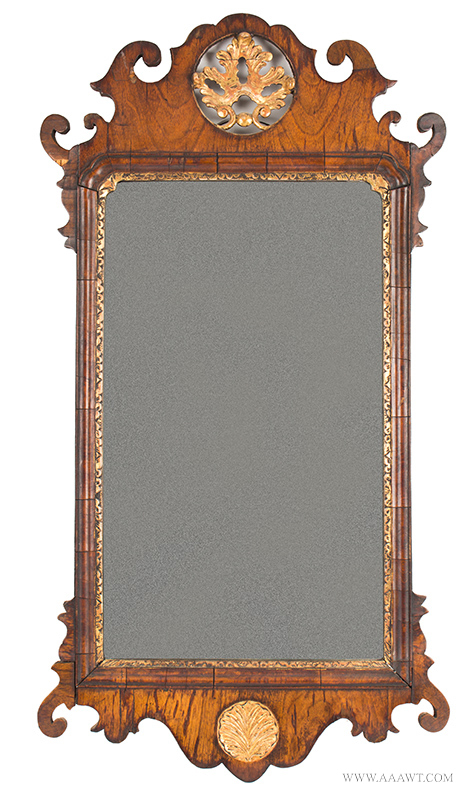 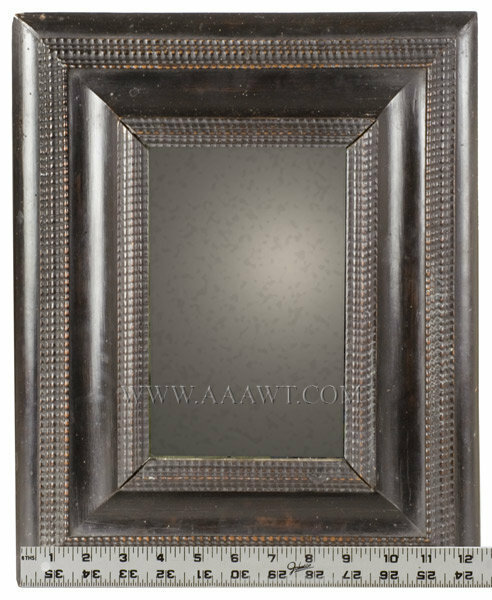 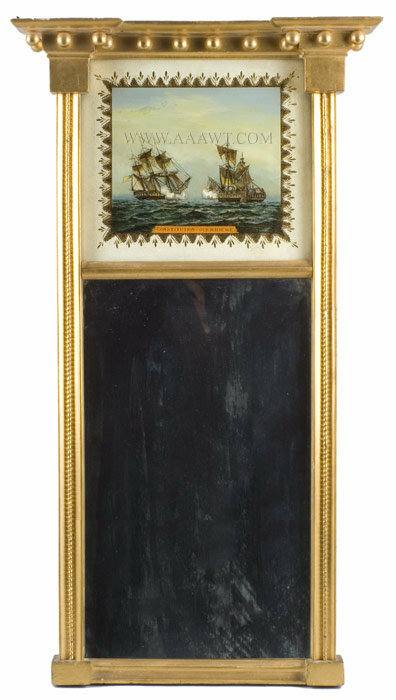 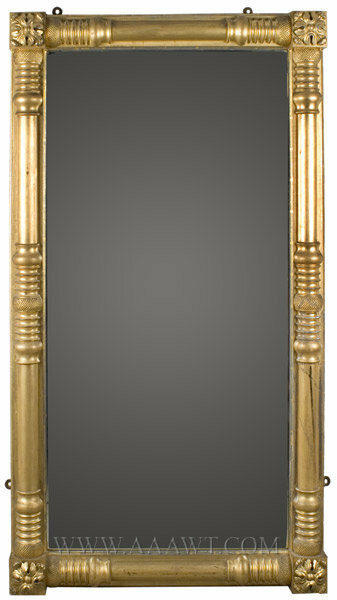 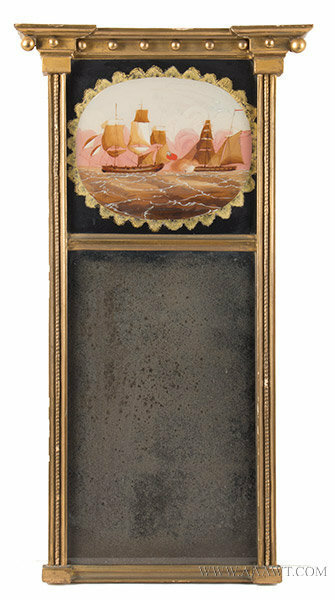 A fine and richly tooled reverse ogee profile, ebonized ripple molding frame with late plate. 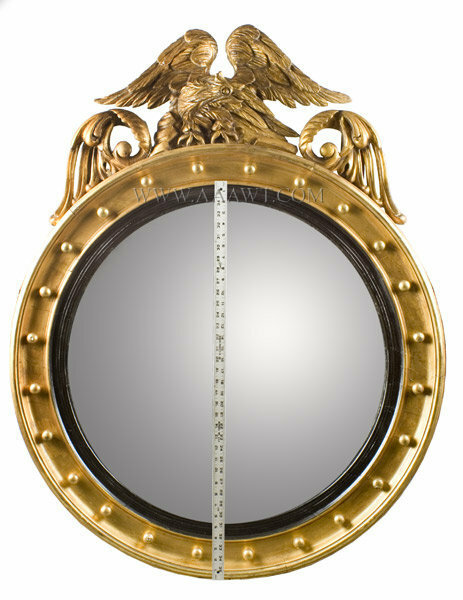 Dimensions: 13" by 16". 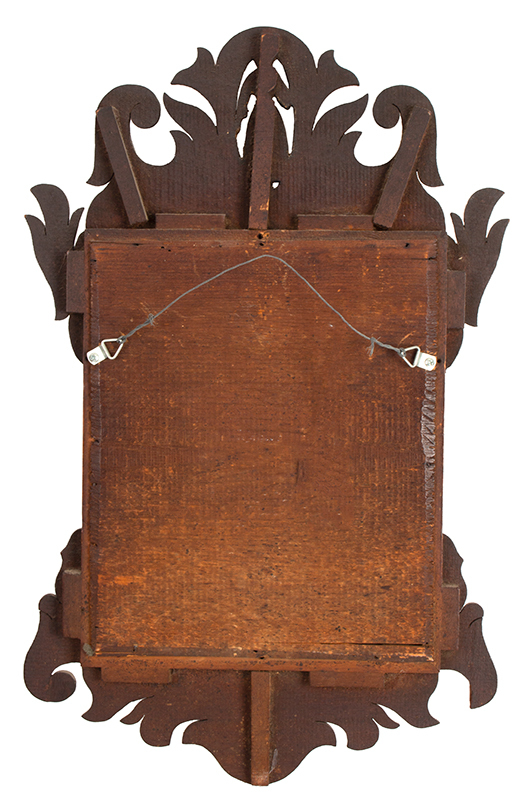 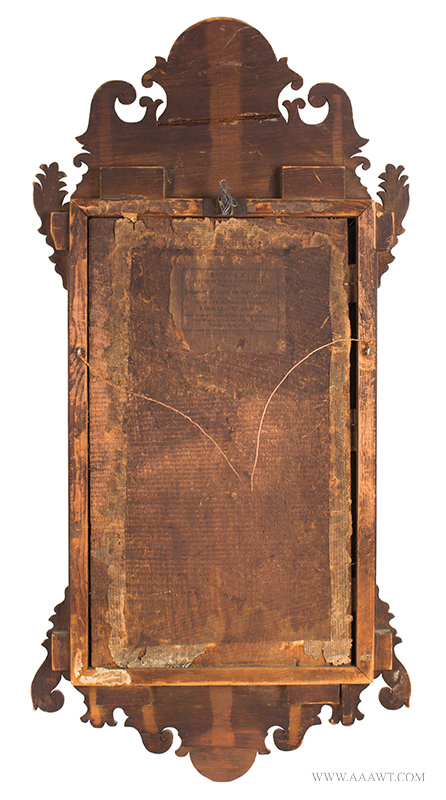 As depicted, tall shaped and pierced crest surmounting the molded frame. 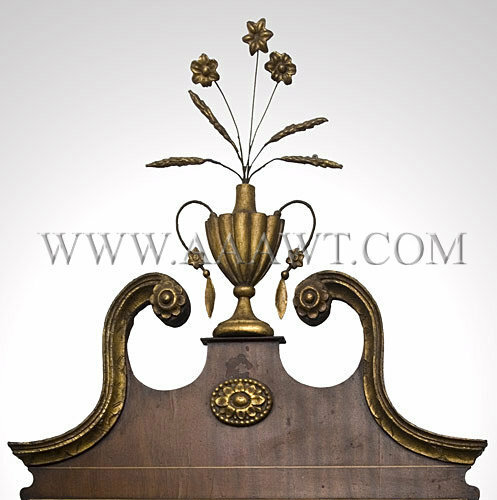 Overhanging cornice with spherules, reverse painted tablet with oak leaf border, the rectangular plate flanked by convex columns with rope-twist decoration. 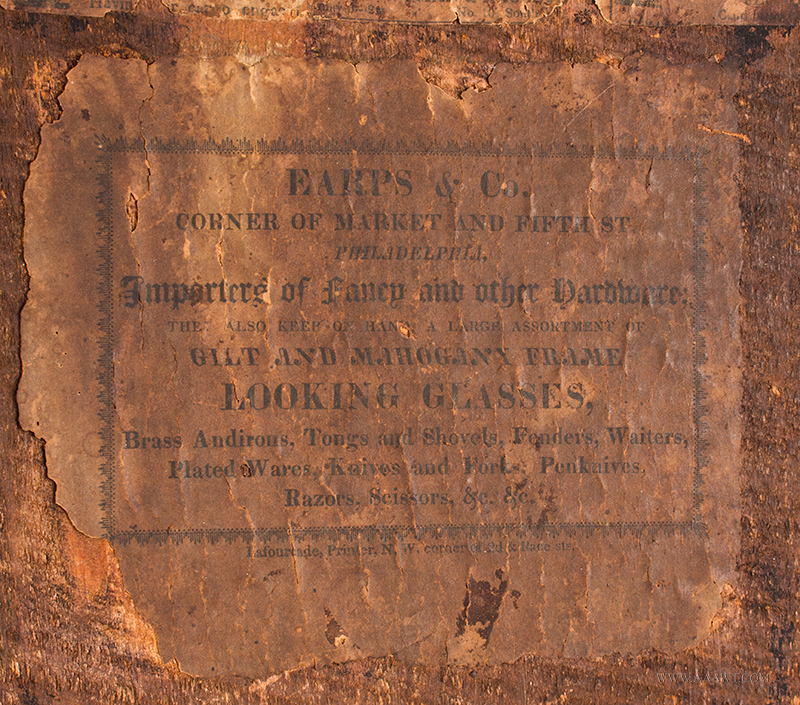 The backboard retains nearly the entire original label advertising Lothrop’s business. 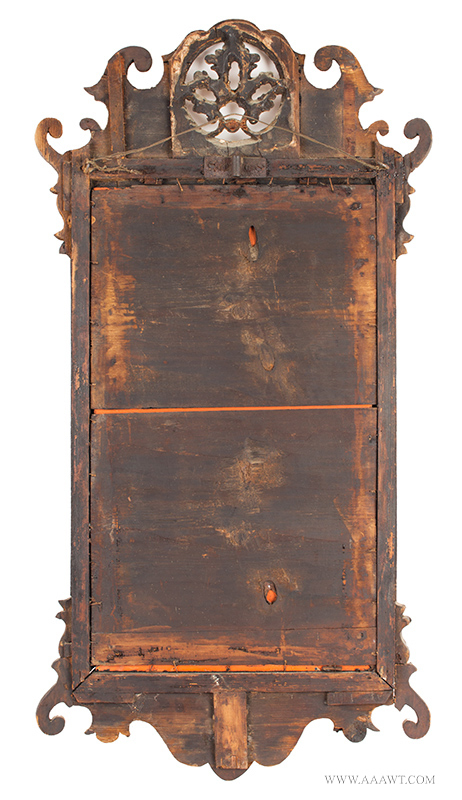 Fan carved crest centered by scrolls cants backwards as does the scrolled and lobed bottom rail; mortise and tenon joinery affix the cove-molded stiles…the slip is molded. 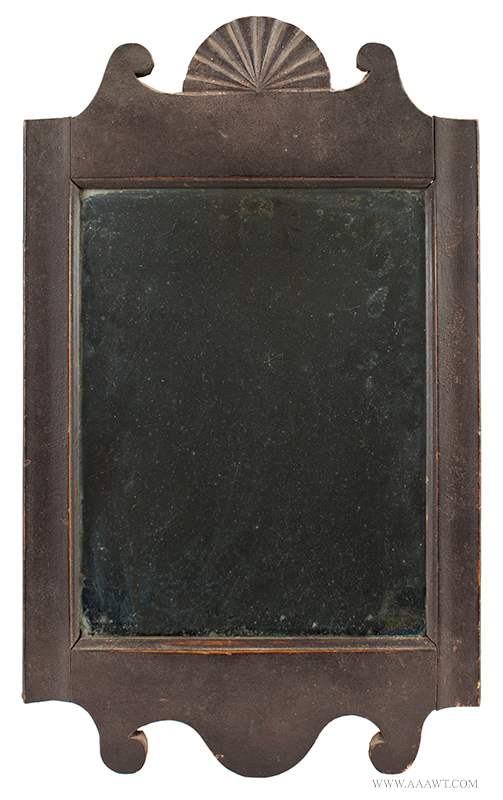 Very early brown paint over red wash. 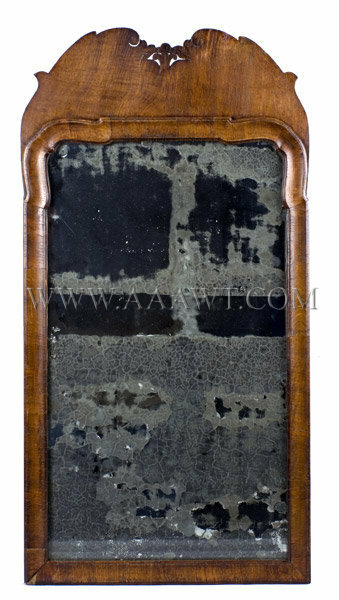 The period glass likely replaced as is backboard, else fine.